Meridian Outpost provides small businesses with a single source for Information Technology needs. Our specialty includes PC support, networking, information assurance and custom systems and database application design. 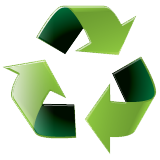 Recycle your used ink cartrdiges, printers, computers, batteries and more. Go paperless and be more productive, gain floor space and save money. Experienced & certified IT professionals are here to grow your business to the next level. Save money, reduce waste and save trees with tips on Green Computing.